Click on the link below to listen to the radio show about Sugar. Endless insulin shots are not your true solution. Using an Insulin Pump will not be a true solution either. When you are ready to address the cause of your diabetes, we are here to serve you. 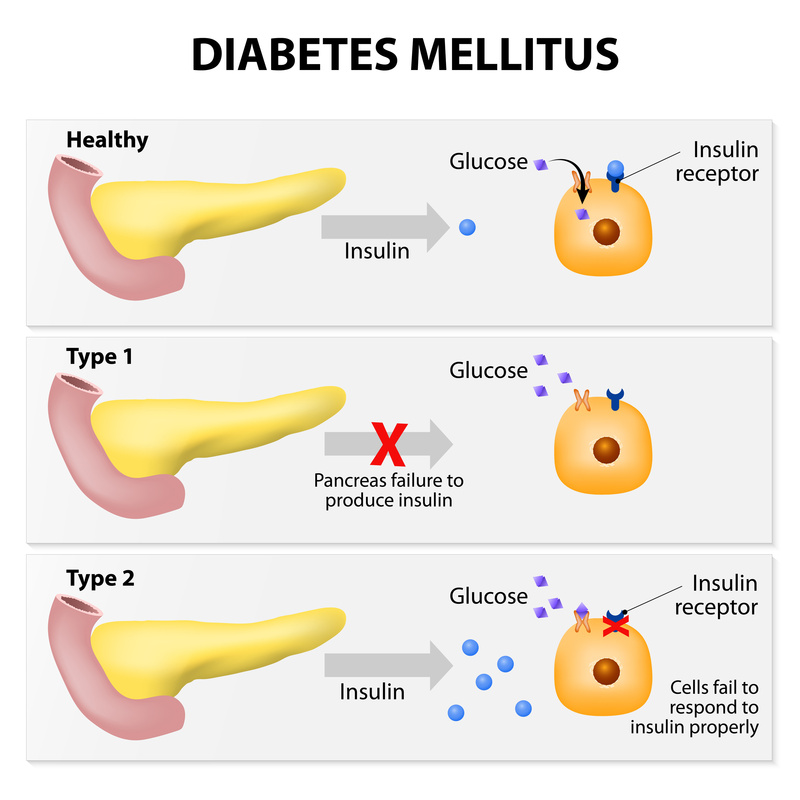 Type 1 Diabetes: can occur at any age, but it is most often diagnosed in children, teens, or young adults. In this disease, the body makes little or no insulin. Daily injections of insulin are needed. The exact cause is unknown. Type 2 Diabetes: makes up most of diabetes cases. It most often occurs in adulthood, but teens and young adults are now being diagnosed with it because of too many refined carbohydrates in their diets and the resulting high obesity rates. Many people with type 2 diabetes do not know they have it. Diabetes affects more than 20 million Americans. Over 40 million Americans have pre-diabetes (early type 2 diabetes). This again is due to the nature of the Standard American Diet which consists of too many Completely Refined And Processed (CRAP) carbohydrates. To understand diabetes, it is important to first understand the normal process by which food is broken down and used by the body for energy. People with diabetes have high blood sugar because their body cannot move sugar into fat, liver, and muscle cells to be stored for energy. Treatment involves medicines (taking insulin), diet, and exercise to control blood sugar and prevent symptoms and problems. People with type 1 Diabetes must use insulin. Some people with type 2 Diabetes can manage their diabetes with healthy eating and exercise. However, your doctor may need to also prescribe oral medications (pills) and/or insulin to help you meet your target blood glucose levels. Studies have shown that better control of blood sugar, cholesterol, and blood pressure levels in persons with diabetes helps reduce the risk of kidney disease, eye disease, nervous system disease, heart attack, and stroke. By working closely with a Holistic Chiropractor who can help you develop a well-rounded, multifaceted approach to addressing your digestive concerns and cravings is warranted. You could have eye problems, including trouble seeing (especially at night) and light sensitivity. Your feet and skin can develop sores and infections. After a long time, your foot or leg may need to be removed/amputated. Infection can also cause pain and itching in other parts of the body. Diabetes may make it harder to control your blood pressure and cholesterol. This can lead to a heart attack, stroke, or other problems. It can become harder for blood to flow to your legs and feet. Nerves in the body can become damaged, causing pain, tingling, and a loss of feeling. Because of nerve damage, you could have problems digesting the food you eat. You could feel weakness or have trouble going to the bathroom. Nerve damage can also make it harder for men to have an erection. High blood sugar and other problems can lead to kidney damage. The kidneys might not work as well, and they may even stop working. Dr. Huntoon has helped several Practice Members manage their diabetes (both Type I - insulin dependent and Type II - non insulin dependent) by lowering their insulin needs or eliminating their blood sugar medication altogether. By addressing the communication imbalance between the Liver (the source of Diabetes) and the pancreas (the symptom of Diabetes), while addressing the digestive imbalance related to excess yeast/candidia causing the cravings for sugar, Dr. Huntoon has enabled his practice members to regain CONTROL of their Type 1 Diabetes with less medication being needed daily, and ELIMINATED their Type 2 Diabetes altogether and no longer requiring medication. Doctor Huntoon as a Type 1 diabetic because my blood sugars were averaging between 200 to 300 while on insulin. With his guidance, care and support my blood sugars are averaging between 85-100 and my A1c is down over 3 points. I ...More"I came to Doctor Huntoon as a Type 1 diabetic because my blood sugars were averaging between 200 to 300 while on insulin. With his guidance, care and support my blood sugars are averaging between 85 -100 and my A1c is down over 3 points. I now feel I can regulate my own blood sugar without requiring so much insulin. If you are a diabetic, Dr Huntoon can help you gain control of your blood sugar and health. Working closely with a Holistic Chiropractor who can help you develop a well-rounded, multifaceted approach to addressing your digestive concerns and cravings is warranted. Addressing your digestive Yeast /Candidia imbalance and restoring balance to your digestive system is vital. Assisting the pancreas to function better with high quality Whole Food Supplements and modifying the diet would be important. This has demonstrated positive results when sticking to a specific treatment plan. If not, you will probably continue to need medication and develop other health imbalances as the course of Diabetes continues. Discussing what is involved and the time commitment necessary to having a full recovery is warranted. Your healthcare provider may suspect that you have diabetes if your blood sugar level is higher than 200 mg/dL. To confirm the diagnosis, one or more of the following tests must be done. Fasting blood glucose level -- diabetes is diagnosed if it is higher than 126 mg/dL twice. Levels between 100 and 126 mg/dL are called impaired fasting glucose or pre-diabetes. These levels are risk factors for type 2 diabetes. Keeping an ideal body weight and an active lifestyle may prevent type 2 diabetes. There is no way to prevent type 1 diabetes. "I came to Doctor Huntoon as a Type 1 diabetic because my blood sugars were averaging between 200 to 300 while on insulin. With his guidance, care and support my blood sugars are averaging between 85 -100 and my A1c is down over 3 points. I now feel I can regulate my own blood sugar without requiring so much insulin. If you are a diabetic, Dr Huntoon can help you gain control of your blood sugar and health." To prevent complications of diabetes, visit your health care provider or diabetes educator at least four times a year. Talk about any problems you are having. By working closely with a Holistic Chiropractor who can help you develop a well-rounded, multifaceted approach to addressing your digestive concerns and cravings is warranted. By getting a handle on your digestive yeast imbalance, restoring your microbiome to a more balanced level and taking a probiotic regularly will allow your digestive and endocrine systems to return to balance and you will no longer have to deal with type II diabetes. This is also great advice for anyone with type I diabetes to minimize the effects on the other aspects of your health.